It seems like a good time to take a fire break. The fire seems to have slowed, containment is up to 38%, and the foothill cities (including Monrovia) appear to be catching a break. 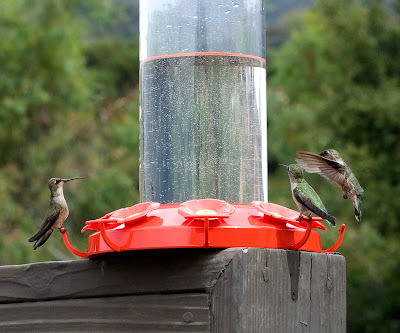 Enjoy 3 hummingbirds whose only care in the world is getting an empty spot at the feeder. I think a lot of us wanted a break today. This is a lovely shot.